I've been hearing a lot about transformation lately—from clients wanting and needing to transform their organizations, consultants with various theories and models on how this can be done, social entrepreneurs with a vision on how the world can work better, and on and on. With one client, there's been almost a year's conversation, planning, design, scheduling, postponing, redesigning, rescheduling, re-postponing, etc. It reminds me of a symptom I've seen in a lot of organizational systems, especially ones that are attempting to catch up with the speed of change in the current acceleration—there's a lot of talk about change and transformation, and not a lot of action and doing. I've also seen the play where they put a lot of energy and focus into refining, updating and technologizing what they're already doing. That's not transformation! And it takes a unique leader that can have the clear sense of what is needed to lead the people through the confusion, pain, and doubt that might ensue to come out on the other side. To be different, you have to do something different. The old Einstein quote about not being able to solve the problems with the same thinking we used to create them. "Here's the way we do it at Alpha Corporation: We go into a room to get a handle on our most pressing business concerns. There's a flipchart; a facilitator breaks out the agendas to pass around... We come up with ideas, prioritize them, and make committees to evaluate them, schedule a review..."
The issue is that they are still approaching the issues from the same perspective, asking the same questions, using the same processes, running the same culture. Even though these problems have been discussed, brainstormed, mulled over, analyzed, problem solved, run up the flagpole, thrashed out at interdepartmental meetings, had money thrown at them, had their budgets cut, had a team of consultants issue a 200-page report on them, and had visiting executives from headquarters come and scratch their heads about them. The FTM team was great to work with and delivered everything they promised. It was an excellent experience. I would highly recommend FTM to anyone who will listen. The whole FTM gang was really wonderful! I also want to mention that the Andes group was behind schedule on both days, and FTM was gracious and patient while we finished up our general session. They even played and sang Happy Birthday to two of our participants. We were so pleased with both days and the great outcomes! I really felt that the participants truly enjoyed themselves, especially when we broke into dance mode toward the end of the evening on Friday; mosh pit and conga line! SO FUN. We loved every aspect of the FTM event. The setup and coordination was easy and seamless, the event was beautifully facilitated and done in a way that engaged even the ones who were nervous, and the end result had participants speaking positively for days. 1. The MUSIC was great!! Starting off with some great music to get people engaged and "groovin" was really helpful. 2. Paul's presence/interaction with the group was really good as well – they were nervous at first, but Paul's fun and confident interaction and leadership helped them get over their fears. 3. The simple templates and song structures that you provide for people to write to is really helpful to get people going. Our team has a different process. We're going to put some music mojo into the process. Get with your team and break out your top issues. The way you can recognize what these are is what engages you emotionally. What?... What things at work get your feelings going? Either up or down? What makes you mad, glad, sad, scared, worried, alarmed, elated, grateful, fearful, amused, agitated, guilty, hopeful, calm, bitter, bored, content, happy, homesick, horrified, humble...alright. Using emotions as the barometer, people have an opportunity to gage what's important to them. The things that get you going emotionally may not necessarily be the things that you consider the most pressing issues on the job, but may contain a key to unlocking some stuck energy inside you, and making it available for you to use to be happier, more productive and more effective. In our songwriting process, people are definitely approaching their issues from a different place. For some reason, the musical perspective also helps people not take the stuff so seriously. They can laugh at themselves, even when they're telling a story about something that had them tearing their hair out—or maybe still has them tearing their hair out. What's great is that they're having fun, and the fun is directly around their work experiences; they're reviewing various aspects of the work life, and they are looking at them through a new lens. It's an almost automatic reframing. In order to discuss one's work issues in a song, one cannot approach those issues from the same point of view. The reframing, and not taking it so seriously, gives them a chance to rethink whatever the issue is with a fresh mind, a chance to get an "ah-ha" that can make a difference. 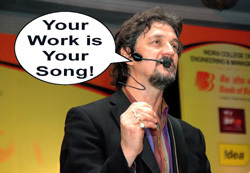 Is one songwriting session going to transform your company's culture and processes? No. But it's a great tool to open the door and create a space to see new possibilities, and to use that zone, that small disruption, to begin creating a new future. Good songs are efficient. They get their message across in few words. They can conjure a whole gestalt smoothly and compactly. How about if your business did the same?
) to organize a flash mob to open the conference that was scheduled for September 29-30, 2014 at the Copacabana located in midtown New York on W. 47th St. The idea the Face The Music Brain Trust came up with was to do a interruptive disruption of the conference intro with a hum on the PA that turned into a "human tuning" session followed by a just-in-time musical piece that the attendees of the summit contributed to by speaking their intentions into a mike and these being looped and morphed into a beat dance piece by a DJ. Then a group of dancers hidden in the audience would jump up and initiate a group dance party. The enrollment of the dancers on short notice turned out to be the main challenge, and the most of the dance mob didn't show up because of traffic or general confusion. That being said, the "it is what it is" rule applied, and the disruptive creative piece took place to the enjoyment of the crowd. Below is an interview with Paul about going with the flow and creating an extraordinary experience against all odds. Ken: How did you make that happen? Paul: Sam Hamdan. (the "Chief Architect" of the summit) was talking and then this tuning fork tone comes on over the PA. I was in the hallway doing a VOG saying "
) and his work with sound and music in healing and awareness. I asked them to think about their intention for the summit for the 2 days, their purpose, then about their higher purpose in their life. Then I walked into the room with a wireless microphone and asked people to say one word into the mic that expressed their intention for being there. Ken: So they just said words into a microphone? Paul: Yeah, Ian Turner (a DJ on stage) was recording their words into a looping device. As the tones went on, Ian started adding little bit of drumbeat and a little bit of this and that. It all started gradually coming up in the mix along with the tones. It became more of a beat thing and the words looped around and he morphed them and included their words into the beat. Ken: Where did it go from there? Ken: What time did this start and for how long? Paul: About 8:55 am, and it went on about 5 minutes. Ken: How your portion of the event was received? Paul: I got a lot of good feedback. One woman was seeing lights and felt it resonating in her heart and body, and several people said it was great to center on your intention for being there. Another woman said she was crying during the contemplation part of it. Other people commented on liking the metaphor of the participants' comments co-creating the piece, similar to how they would be co-creating the summit together. Ken: Did you hang for the whole conference? Paul: Yeah, People were coming up to me the whole 2 days. I had tuning forks with me and would whip them out every once in a while and tune people. A new buddy of mine from England seemed a little agitated at one point; so I tuned her and she said "
Wow, it's like drugs for your ears!